Life cycle: This insect produces three to four generations each year. Physical Description: This black and white or sometimes brownish bug is only 1/20 of an inch long, is flat and very active. Its eggs are clear or white and are laid in plant tissue. Feeding characteristics: This bug, adult, and nymph, will eat aphids, spider mites, and thrips. 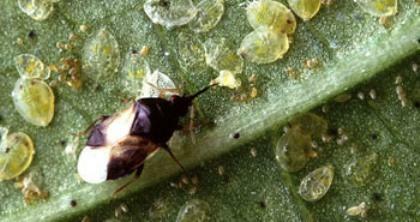 Purchase Pirate Bugs at Organic Garden eStore.